Still an exciting concept but there are restrictions here, so you may decide that the original Tenori-on is the better bet. A unique approach to sequencing and track creation. A cheaper way to get onboard with the Tenori-on concept. Brighter, clearer LEDs. No battery powering. No USB port. Sampling time limited. No rear-panel LEDs. Premiered back in 2005, Yamaha's Tenori-on, designed in collaboration with Toshio Iwai, represented a breakthrough in its approach to sound production and sequencing. 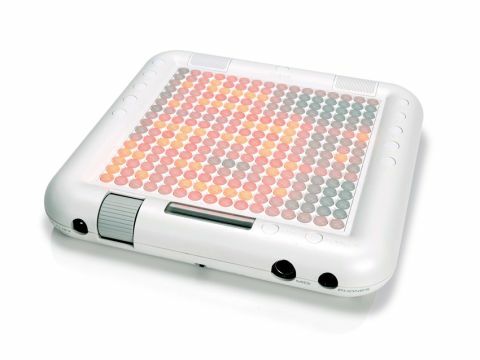 Its 16x16 matrix of playable LEDs lets users create intricate, multitimbral performances using the internal sounds, or over MIDI to any sound source desired via 'buttons of light'. A simple press of any LED triggers a note and the internal sequencer does the rest, playing single notes or chords as the step sequencer cycles round. The concept has proved popular, particularly for performers keen to draw attention to the unit. Bill Bailey famously featured a Tenori-on on his comedy tour and the unit also features prominently in Little Boots' live sets and her Remedy video. Fast-forward five years and Tenori-on Orange now greets us. With most of the original's functions carried over, this represents a more economical way to get your hands and fingers on Yamaha's concept, but there are some crucial differences between this and the original (now dubbed the TNR-W) so it's well worth a second and closer look. The principal differences between Tenori-on Orange and its big brother are physical. Whereas the original Tenori-on features a brushed aluminium construction, its sibling uses a tough white plastic surround instead. Perhaps more significantly, the new unit features no battery power option, with mains power instead supplied via a bundled wall-wart that connects, somewhat inconveniently, via the front bottom left hand corner. Also, as a cost-cutting measure, the rear LEDs from the back panel have been removed, leaving a blank white panel in their place. While these LEDs aren't 'active' on the original Tenori-on and simply reflect the pattern playing, they do represent an eye-catching performance element that is lost on the new unit. On the upside, Tenori-on Orange gets its name from the new LEDs which ditch the original 'white' lights in favour of orange ones instead. These are really pleasing on the eye and show up nicely. "The principal differences between Tenori-on Orange and its big brother are physical." The sound engine at the heart of Tenori-on remains the same - 253 AWM2 generated tones (including 14 drum kits), capable of producing 32 notes of polyphony, with the option to add reverb and chorus to each of the multitimbral layers within a sequence. Additionally, Tenori-on can play back user samples of up to 0.97 seconds in length (saved to the rear-mounted SD card) or can output its sequences via MIDI. On this subject, improvements have been made courtesy of the recent firmware Version 2.0 update. Version 2 was launched to address some key issues. For a start, processing performance has been enhanced so that the 'lag' some users experienced with note input is significantly reduced. MIDI sync has been looked at too, with the aim of enhancing Tenori-on's integration into DAW environments. Unfortunately, things don't run as smoothly here as Yamaha intended. As MIDI controls are still carried out via a breakout MIDI I/O cable, the immediacy of USB connection, favoured by the majority of today's controllers isn't present here. I experienced some frustrations slaving the unit to synchronise within Logic and the manual isn't terribly helpful either. 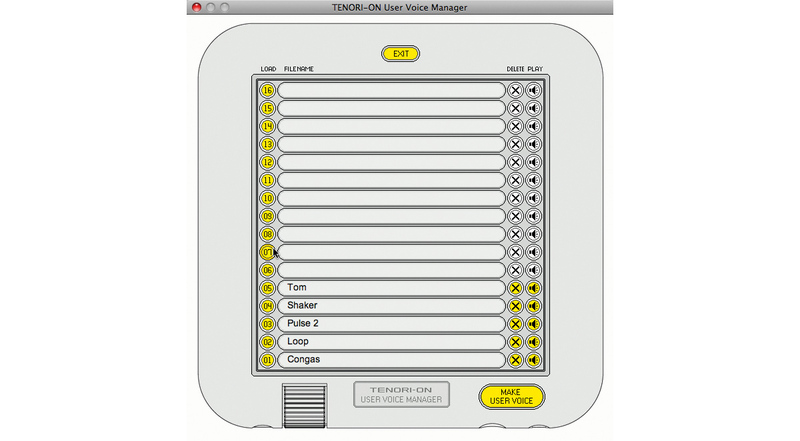 Also bundled is Tenori-on's Voice Manager, which lets you configure sample content ready for transfer to an SD Card. In case you've missed out on Tenori-on's wonders, it's worth briefly recapping its modus operandi. A range of modes are available with the system, with Score Mode at the top of the function list. This provides multitimbral playback of a number of internal or MIDI sounds with each sound assigned to a Layer which can have a sequence created for it simply by holding down LEDs which correspond to notes in a sequence. Alternatively, you can use modes like Random to create 'join the dots' style, less predictable sequences, or Solo mode to construct sequences with different quantise values for a single instrument - perfect for drum sequencing. Via the ten function buttons on the case to the left and right, you can access parameters specific to either the current sound or sequence playing, so it's possible to build complete performances by dropping from one section to another, temporarily muting instruments, assigning effects to them or adjusting their volume in real-time. It's immediate and fun, but also capable of truly sophisticated results once you've familiarised yourself with Tenori-on's approach. As the hardware alterations suggest, Yamaha sees this as the studio Tenori-on. This being the case, it's important to ask how well this instrument integrates into the studio environment and whether its feature set matches that which the majority of musicians would want? The AWM2 soundset onboard is nice to have as a scratchpad to learn Tenori-on's functions and capabilities but we do think that the majority of studio users will soon want to break out from these sounds and apply Tenori's unique sequencing approach to their own noises. Obviously, this is possible via the MIDI breakout cable, but it's fiddly and, as the unit doesn't feature USB and integrate as readily as the majority of controllers available today, this does strike us as a missed opportunity. Equally, the option to work with samples is great but the 0.97sec sample limitation is restrictive. We feel in a way that time has caught up with the Tenori-on, and whereas a completely independent hardware unit offering these facilities made sense in 2005 and continues to for the 'big brother' model, were we designing a studio Tenori-on, we'd suggest different changes to those Yamaha have implemented. The RRP of £599 is perhaps our biggest disappointment, however. Despite 'missing things out' and making the machine out of less impressive materials it's the same price as that originally charged for the original model, which now goes for £699. Forget any notion of the 'bargain Tenori'. This isn't it. Perhaps the future of Tenori is a control only version, which completely removes the internal sounds and instead provides a USB port and a neat application to let you use the LEDs for note input, clip launching, and even MIDI CC on/off commands. Meanwhile, everything that's unique about Tenori-on's brilliant sequencer would remain. That's the kind of studio Tenori we'd like to see. But, until such a time arrives, we'd recommend choosing between the current model and new Orange version carefully.